The price is a bit high, but it's light and compact. This review is about item#34933997. It is easy to use in a size that just enters the waist bag. I was worried whether power is difficult to enter because it was short, but it did not matter. This review is about item#34934006. Flare glasses did not have this size, so purchase as a substitute, there is no problem to use. This review is about item#34934015. I lost it so I looked for the cheapest one. It is extremely compact and light, and it will be saved as a tool to be standing in the waist bag. 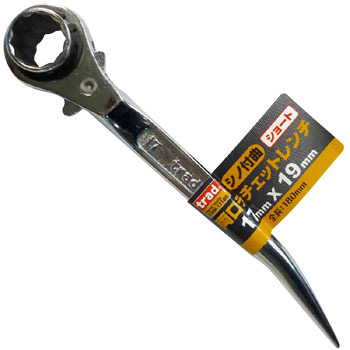 Because of its small size, it is disadvantageous on the lever principle, but the head of the ratchet part is also small and it is often useful. I do not feel like using any other. What I need something I always carry around in the corner of the tool bag.